Today I got thaaangs to do! - errands, help with last minute baby shower stuff, and my doctor's appt. It was pouring all morning and I was so sad D wasn't here to snuggle, but luckily I always have baby bird with me. She moves a lot when I talk to her now, and I'm willing to put money on it that she's actually responding to my voice at this point. Ca-ray-zay! Oh and here's a random question: What are your thoughts on episiotomies? D and I wrote out our birth plan last night but when it came to our thoughts on this subject, I felt completely neutral about it. Any of you strongly for or against them for any reason? I've read before that they can actually be more dangerous for you but that was only one source and didn't sway me one way or the other. Any input would be appreciated. i guess you could say i'm against them? but honestly, the doc knows best when the time comes. the thing about them is that it's harder to heal because it's a straight cut. when you tear naturally your skin is left "jagged" which is easier to mend together. plus, if you get one then you'll always have to get one. i tore naturally and it wasn't really a big deal at all. my friend got an episiotomy and they ended up having to cut her more than if she were to just tear naturally. and it took her forever to heal. i was seriously feeling practically back to normal about 2-3 weeks after baby. Aw- great pic! When was the first time you felt her kick? Jess: oOoOoooo yes the fastest healing possible would be the way to go.. thanks for the info! New reader here, love the blog! Im not down with Episiotomies... I think if you prepare your body (perineal massage, kegals, etc.) there is a good chance you won't even tear. So against. Your body is likely to stretch on it's own and not tear at all (I had a tiny tear, one stitch- and my babe came out face first). You will heal and go back to... normal? (it is gross to say tight? ew, yeah but true) a lot more easily without one. Also, they frequently cut you FAR more than you need and then it is just lame to get sewn up and heal (and sit on it) for the next few weeks. It causes and can cause some "tough" times in the healing. But do not worry! The doctor WILL NOT do it unless he feel necessary! 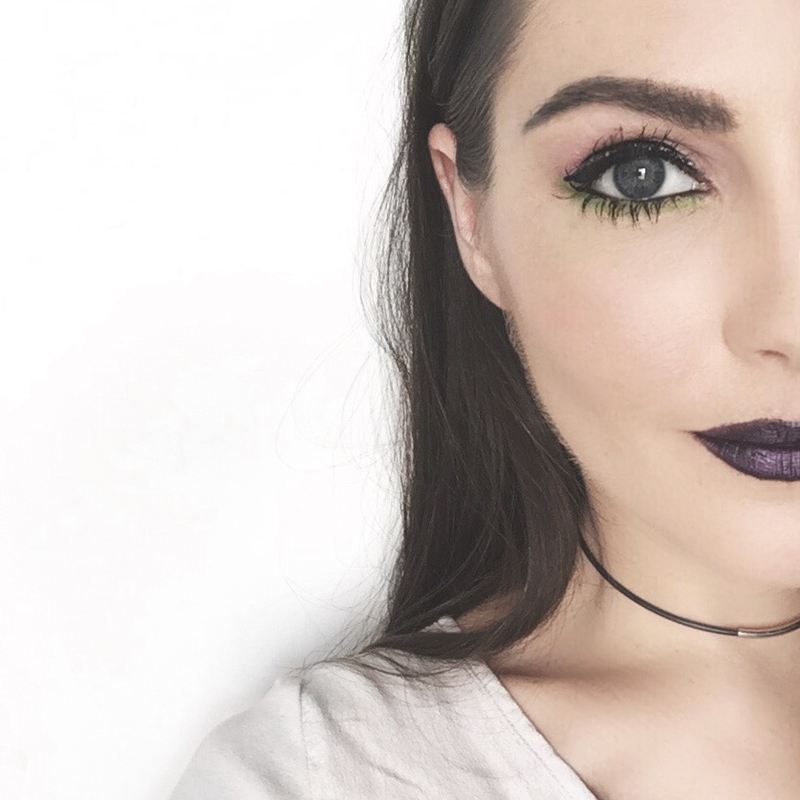 Jess2Impress: Hello and thank you! I'm definitely trying to "prepare" as much as possible.. hehe.. lets just hope I don't tear at all indeed! Autumn: Oh man all these comments are making me want to write a big bold NO next to episiotomy on our birth plan..
Hey pretty mama!I love this picture! Since I work in the birthing center I see different things, but I would have chosen no epis. Unless there is a need for it, of course. And you know I haven't seen that many epis done. Besides, most of the tearing that I have seen has been minimal and requires just 1 suture. Its great to be prepared! But sometimes things end up changing. They did for me. All that matters is that you and the baby are healthy! Are you going to do kangaroo care when your little one is born? I had an episiotomy, my baby was posterior and she pooped, so they had to get her out in a hurry. I was definitely on the "no episiotomy" boat, but there is a time and place for them. I healed up nicely and it didn't take forever either. I'm pregnant with my second now and would have one again, IF it was necessary. The way I look at it is if you stretch and not tear at all, that's great, but on the other hand, I would rather have a nice straight cut to heal up, then a ragged one. Sherylee: I guess it will just have to be something where I prefer it not be done but we'll just have to wait and see what happens in the moment and stay open-minded ;o) thanks for the tip! everyone has given you really great advice. i am also not for them and would much rather tear on my own [and tear i did! third degree!] but i healed quick and didnt have much pain at all afterwards. ive read its like tearing a piece of cloth. if you try to pull it apart you wont get very far, but snip it with some scissors and it tears much more easily! and i love that picture of your buddha belly! haha thanks Jill! that cloth reference pretty much hits the nail in the head! I wish that I would have known about Kangaroo Care when I was pregnant with Evangelina. It is such a neat thing. And the story behind it is so wonderful! Do they take the babies into a nursery to do all the assessments? Do they keep the babies there? Here at my hospital, we don't take the baby away unless it is critical. The baby stays in the room with the mamas the whole time. Except for assessments at midnight. But we weigh them in the room, give them eyedrops in the room and everything. I love it like that. I didn't get to see Evangelina for about a whole hour after she was born. it was excruciating. Call me a nerd, but I like to learn about what other Birthing Centers are doing. haha. I wish that I would have known about Kangaroo Care when I was pregnant with Evangelina. Its such wonderful thing. And the story behind it is amazing. Do they take the baby away from you in the begining? Do they keep the babies in the nursery there at the hospital? In my hospital, we doing everything in the room with the mother. We weigh, assess, and give initial meds to the baby there. I love it. When I gave birth to Evangelina I was out in Utah and I didn't get to see Evangelina until an hour after I had her. It was excruciating! And then she was kept in the nursery because she had an infection and jaundice. I would have never let her out of my sight if I didn't have to. Here at my hospital, mothers alway roll their babies out at night time for us to watch them. And then they don't want them back until at least 7am. How crazy is that?! Sorry I am rambling. I am on break at work and was a bit bored. haha. Posidanielle: haha you're so cute! that's not nerdy at all! basically i get baby from birth until 59 minutes!! THEN they do take her out of room for stats/eyedrops/etc BUT either derek or both of us will be in that room with them as well. the birth center is small and intimate with only 10 (big) rooms! and you pretty much make the rules and they're very good about letting you personalize your experience and able to focus more on you since there most likely won't be any other patients there! i really like it because its intimate and yet i'll still be in a hospital for all of my "just in case" worries. i don't know how far back you've read on the blog but i posted about when i went to see a psychic that i had been to before.. i know it sounds silly but shes TOTALLY legit and its crazy! anyway, she told me that i would end up having a cesarean birth because the umbilical cord would be wrapped around baby's neck and she'd show signs of distress during labor! :o( so yes... it's important for me personally to be in a hospital just in case. plus, did you see our latest ultrasound pictures? i literally GASPED when the technician started and i saw that umbilical cord all over her like that! Oh my! That is nuts. I've always wondered about a psychic. My dad has worked with one a couple times on some cases, but I've never met one. That's great that the hospital is like that. Our labor rooms are a nice size and we have a nurse dedicated to only you during labor and delivery. I really hope that your delivery doesn't end up in a cesarean. They aren't fun. I ended up having one with Eva. I will definitely be praying that it doesn't end up in one. my mum (a midwife) says to get into the perineal massage and you wont need an episiotomy. Sounds pretty good to me. But I have also heard it is much better to tear naturally as it is easier to heal. ps. 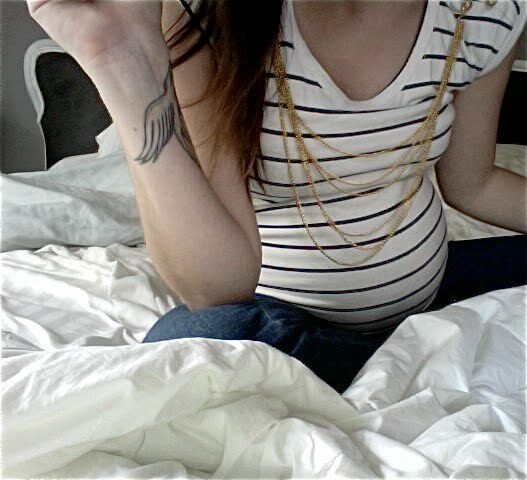 love hanging out in bed with a belly too. nice family time. not that I have anything to add... but my doc was against episiotomies to begin with. He said, "If you're gonna tear, I'll let you tear. I don't do them." I was fine with that. I did tear, both times and it was no biggie. My doc stretched and massaged the opening a lot during delivery (I had a long one) so there was minimal tearing.... maybe 15 stitches, which is nothing in comparison to many... and my son was 9.5 pounds and sunny side up. Anyway... in a nut shell.... Picture a leaf. When you tear a leaf, does it tear in a straight line? No. It tears along it's natural lines. You are no different... your body was BUILT for this. Women have been having babies forever...and in only a matter of weeks, you'll be spewing gobs of advice to other scared, excited, etc... expectant mothers. hey jess i'm not sure who is going to deliver your baby but my lady was so awesome, she used mineral oil, like a whole bottle and a half on me. she kept pouring it down there and kinda rubbing with her hands (sorry to be so graphic) but it TOTALLY helped. i didnt tear or anything so idk if thats maybe something you could talk to your doctor about? also, at castle they dont take the baby out of the room to do any of the weighing or measurments or bathing. in fact they only took liv out once, i cant remember if it was the 1st or 2nd night there, and it was for a quick heel prick. she was back within 15 minutes. i do wish i sent my bf with her because i could hear her crying, but it was quick. unless of course you do end up with a csection, then i guess things are totally different. good luck with everything! Rin: D and I definitely plan on doing perineal massage! Hopefully it helps so much that I don't tear at all! I read a ton of books when I was on bed rest for five months. (Ugh.) I had a plan and vision for how I wanted my birthing to go. And I was very anti-episiotomies. Then comes the day for baby and I didn't care about ANY of it anymore. I just wanted a happy, healthy baby. I had no overnight bag, no music, no camera - zero, zip, nada! I was going in for a check-up when they told me to call my husband and cancel our plans. Baby was coming. And as far as episiotomies - I ended up having one. Not by choice, but because my baby stopped breathing. He was too far down the birth canal and he needed to come out fast. And fast he did! P.S. My baby turns 13 next month. my episiotomy saved my kids life. no joke. If we had waited another 30 seconds he would have been dead. My original birth plan had me all natural water birthing at a birth center (i went into early labor so the BC got nixed). Going into it i wanted no intervention however my outlook now is do what ya gotta do to keep my kid safe. Aly: wow i can't imagine just going in for a regular check up and then all of the sudden being admitted! that's exactly the reason we're packing our hospital bag this weekend.. just in case i go into labor early and D or a friend can always come get our bag for us if we're not home. glad to hear everything went well for you though! we'll just have to wait and see what happens for us..
Adriana: exactly.. best case scenario, i dont have one.. but if it needs to happen i can handle it for the safety of the baby of course! I was never afraid of anything about the birth process EXCEPT when it came down to an episiotomy. I cringe just thinking about it. So painful, and imo so unnecessary considering your body pretty much knows what to do. Thankfully even having given birth to three kids and two of them 9lbs along with my small frame I never had to have one and I never even tore!